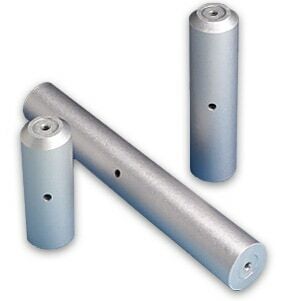 Our PSR series platform support rods are a solid solution for supporting platforms or other mechanical hardware. 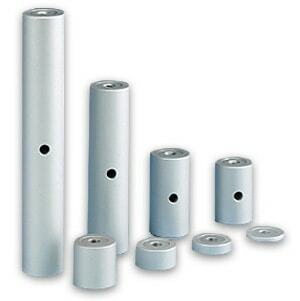 Our PSR platform support rods are specifically designed to be used with our 1200 and 12000 series platforms. PSR platform support rods are cross drilled to accept a 3/16 hex wrench. This cross hole enables secure tightening to AS spacers, isolation table tops, or other mechanical devices. When used in conjunction with AS aluminum spacers, accurate placement of our platforms, manipulators, or other devices is easily achieved. 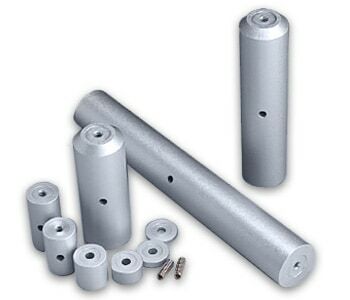 Use AS aluminum spacers for spacing of any device that needs to be adjusted in either the vertical or horizontal plane. AS spacers can be used by themselves or with ABP series base plates. They are also useful for added height adjustment on top of our PSR platform support rods. For horizontal applications use our BB-1.0 building block cube attached to the top of an AS spacer, then bolt another AS spacer to one or more of the four sides. Individual size spacers are available in packages of 4. The assortment kit(AS-1A) includes one(1) each of AS-0.125, AS-0.25, AS-0.50, AS-1.0, AS-1.50 & AS-2.0 spacers size plus two (2) 1/4-20 x 5/8 stainless steel set screws for attaching the AS-1.50 to the AS-2.00.